The graphic on this wallet really makes a statement. It's still available in 12 letters. Find it for just $12.99 (orig. $18.00) from Urban Outfitters, here. oooh, i like this, a lot. "C" is still available too. I don't love thr "M" it looks like an m&m or something. 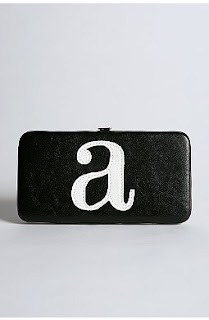 I think "a" is my favorite... aesthetically speaking.